Today I reaffirmed my love of my own potato salads by making another of my olive-oil-based ones, this one seasoned with just shallots and tarragon. I know it sounds haughty, but hardly anyone I know makes potato salads as good as mine. Did I say that? But I have worked out a simple fragrance-producing technique that’s open to all sorts of improvisational touches, and if I keep the ingredients down to a minimum, the results always seem to please me very much. My technique turns out clean potato salads in the Mediterranean tradition. Wine, lemon, and extra-virgin olive oil are my base flavors, the ones that produce the salads’ fragrant underpinnings. I usually start by dressing warm potatoes with wine and giving them a toss. Then comes olive oil, and maybe some lemon. Then I move on to my improvisations, which can include garlic, all sorts of onion things, and herbs or greens. I may then include stronger touches, including anchovies, capers, or pancetta. But that’s about as complicated as I get. I like to taste the waxy little potatoes through my simple seasonings. I have to admit I didn’t start out loving potato salads. Not until I began making them myself. I grew up on New York deli potato salads, usually with mayonnaise, sometimes with hard-boiled eggs too, and often with chopped pickles. They were mushy and mayonnaisy and seemed gross. Even the “German” versions were peculiar, if slightly better, with bacon and paprika, but they were usually way too vinegary for me. Where were the potato salads of my dreams? I knew they were out there, but not until I picked up Hemingway’s A Movable Feast when I was in high school and read his description of the oil-soaked, dripping bowls of potato salad he’d wolfed down with cold beers at the Brasserie Lipp in Paris did I begin to feel I’d been really gypped. After that enlightening read I began researching the subject, primarily in French cookbooks (and in a few Italian ones too), and I found loads of recipes for boiled potatoes tossed with good olive oil, a shallot, a few herbs. That was the taste I had been looking for. It’s funny, though, because I knew that somewhere in my taste memory this type of dish was familiar to me. Eventually I realized why. My grandmother had used to make potatoes this way all the time, serving them at room temperature, sometimes with onion or garlic, with bits of anchovy or capers, or with parsley, oregano, or basil, but since nobody ever referred to that as a salad it never occurred to me that the object of my desire had been staring me right in the face. What I was looking for was already mine. I just had to bring it back into my life. 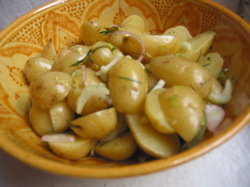 This revelation occurred many years ago, but these potato salads are still a huge favorite of mine, especially in the summer with all the just-dug little potatoes at the Greenmarket. So now that I’ve come full circle and sorted it all out, I offer you a few of the potato salad improvisations I’ve been coming up with lately, all based on summer produce. Use my Baby Yukon Gold Salad with Tarragon, White Wine, and Shallots as a master recipe. All the subsequent recipes are just variations, using the same basic technique as the first one. The most important step in preparing any of these potato salads is the cooking of the potatoes. Put them in a medium-size pot and cover them with cool water about 2 inches above them. Add a generous sprinkling of salt, and bring to a boil over high heat. Lower the heat just slightly, and let the potatoes boil, uncovered, until they’re just tender when poked with a sharp knife. Try not to cook them any longer or their skins will start to fall off and the potatoes themselves will fall apart. I like them to retain a firm, waxy texture. They also look very pretty smooth, uncrumbling, and glistening with their dressing. Most small potatoes cut in half, like the kinds I suggest for these salads, take about 5 to 6 minutes of boiling, but check after 4 minutes. When they start to smell like potatoes, you know they’re almost there. Drain the potatoes in a colander until fairly dry (without shaking them, since that can break them up), and transfer them to a large serving bowl. Pour on the white wine, and toss gently. Let the warm potatoes sit soaking up the wine for about 2 or 3 minutes (pour off any excess). Drizzle on the olive oil and the squeeze of lemon juice. Add the shallots, nutmeg, black pepper, and tarragon, and give them another gentle toss. Taste to see if they need more salt. Serve warm or at room temperature. This sort of potato salad is best made not too long before serving and not refrigerated. I love this tarragon-flavored salad served with grilled or roasted chicken (and the chicken maybe seasoned with a little mustard and a bit of tarragon or parsley). Cook two pounds of red bliss potatoes (or any other small red potatoes) as in the above recipe, and drain. Place them in a serving bowl and toss with a teaspoon of sherry wine vinegar, two tablespoons of extra-virgin olive oil, four or five chopped anchovy fillets, one thinly sliced shallot, a handful of chopped celery leaves, and a few chopped thin, inner celery stalks. Season with a bit of cayenne or Aleppo pepper, and toss. You probably won’t need any extra salt. Serve warm or at room temperature. This salad is great alongside an oily fish. Try grilled sardines or mackerel or bluefish, possibly baked with chopped tomatoes and white wine. Cook two pounds of small creamer potatoes (or another small beige potato) as in the recipe at top, and drain. Place them in a serving bowl, and add a teaspoon of lemon juice, two tablespoons of extra-virgin olive oil, a small, minced summer garlic clove, two chopped scallions, and a handful of blanched string beans. Season with a pinch of salt and black pepper, and toss gently. Add a handful of basil, cut into thin strips, and a scattering of toasted pine nuts. Toss again. Serve warm or at room temperature. The last time I made this I served it with tuna steaks, grilled rare, sliced, and dressed with lemon zest and olive oil. Cook two pounds of fingerlings as in the recipe at top, drain well, and then place in a serving bowl. Pour on 1/4 cup of rosé wine, and give it a toss. Let this sit for about 3 minutes; then drain off any excess wine. Now add a few very thin slices of red onion, a palmful of capers, three small sprigs of chopped rosemary, two tablespoons of extra-virgin olive oil, 1/4 teaspoon of Dijon mustard, a pinch of sugar, a few scrapings of nutmeg, and some black pepper. Toss gently. Add a little salt if needed. Serve warm or at room temperature. This salad is at its best served with sautéed or grilled sausage, especially lightly smoked sausage or a good Italian pork sausage. Chop four plum tomatoes into small cubes and place them on a cookie sheet. Drizzle with a little olive oil, and sprinkle with salt. Roast in a preheated 400 degree oven until they’re lightly browned at the edges, about 10 minutes. Cook two pounds of small Yukon gold potatoes as in the recipe at top, and drain. Place them in a serving bowl, and pour on 1/4 cup of dry vermouth, giving them a toss. Let the warm potatoes sit soaking up the vermouth for about 3 minutes and then drain off any excess. Now add two tablespoons of extra-virgin olive oil, a large, minced fresh summer garlic clove, the lightly chopped leaves from four marjoram sprigs, a pinch of salt, black pepper, and the roasted tomatoes, and give everything another toss. Serve warm or at room temperature. This is excellent with grilled, boneless leg of lamb or with pork chops sautéed with a few sliced summer bell peppers. Cut two thin slices of pancetta into small cubes and sauté them in a tablespoon of olive oil until brown and crisp (but not black). Cook two pounds of red bliss potatoes (or another small red skinned potato) as in the recipe at top, drain well, and place in a serving bowl. Add the pancetta with its cooking oil, a tablespoon of extra-virgin olive oil, a generous squeeze of lemon juice, a pinch of salt, and some black pepper, and toss gently. Now add a small handful of purslane* torn into little bunches, two chopped scallions, and the chopped leaves from a few large thyme sprigs. Toss again. Serve warm or at room temperature. I love this one with grilled salmon. *Purslane is a summer succulent that has a great crunch and a refreshing lemony tang. I find it at farmers’ markets beginning in July and in some highbrow supermarkets. If you can’t locate it, a handful of chopped dandelion greens will work well instead. Wow. Now THAT is some serious tuber love. I look forward to trying them out. Thanks. Hope you like the recipes. And about potatoes, keep them small, keep them young, keep them firm, and you won’t gain weight. Happy summer cooking to you.